This is the surprise Festschrift presented to Rev. R.J. Rushdoony at his 80th birthday celebration in April, 1996. 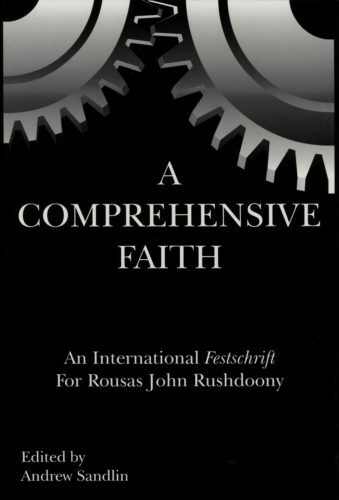 These essays are in gratitude to Rush's influence and elucidate the importance of his theological and philosophical contributions in numerous fields. This book was produced as a "top-secret" project by Friends of Chalcedon and donated to Ross House Books. It is sure to be a collector's item one day. 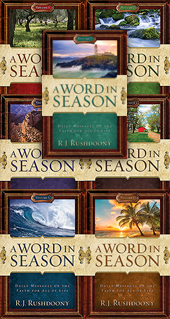 The impetus behind these essays constitutes not merely profound gratitude for the unparalleled godly influence of R. J. Rushdoony, but also the endeavor to elucidate and employ Rushdoony’s foundational thinking in numerous spheres. Andrea carries out a number of administrative duties at Chalcedon, putting much attention on promoting Chalcedon through social media and conferences. A main focus includes her direction of the Chalcedon Teacher Training Institute (ctti.org) -- online classes in Biblical law for women. She began working for Chalcedon as a volunteer in 1987 and has been on staff since 1992. Byron Snapp is a graduate of King College (B.A.) and Reformed Theological Seminary (M.Div.). He was Associate Pastor at Calvary Reformed Presbyterian Church, Hampton, Virginia, from 1994 until his retirement in December 2014. He is a native of Marion, Virginia. He has had pastorates in Leakesville, Mississippi, and Gaffney, South Carolina. He served as Assistant Pastor in Cedar Bluff, Virginia prior to his ministry at Calvary Reformed. He has served as editor of the Presbyterian Witness and was a contributor to A Comprehensive Faith and Election Day Sermons. He is currently a member of Westminster Presbytery in the PCA. He and his wife Janey have 3 children and several grandchildren. Mr. Titus practices law in association with Troy A. Titus, P.C., in Virginia Beach, Virginia and is of counsel to the law firm of William J. Olson, P.C. of McLean, Virginia. He specializes in constitutional litigation and appeals. Christine Schirrmacher (born 1962), M.A., Dr. phil. (Ph.D.), in Islamic Studies at the State University of Bonn, Germany, is married to Thomas Schirrmacher, the mother of two children, and lecturer of Islamic Studies at Martin Bucer Seminary Bonn and Hamburg. She is also professor and head of the department of Islamic studies at Whitefield Theological Seminary, Lakeland, Florida. She is author of a two-volume standard introduction to Islam, as well as of books and numerous articles published in German, English, French, and Dutch magazines. She can be reached at [email protected]. Dr. Joseph C. Morecraft, III, is a preacher of the gospel and a noted lecturer on contemporary political and historical trends in the United States and world at large. He is the founding pastor of Chalcedon Presbyterian Church (RPCUS) located near Atlanta, Georgia. He is married to the former Rebecca Belcher of Haysi, Virginia, who is a writer and an accomplished singer. They have four children and two grand-daughters. P. Andrew Sandlin is a Christian minister, theologian, and author. He is the founder and president of the Center for Cultural Leadership in Coulterville, California. He was formerly president of the National Reform Association and executive vice president of the Chalcedon Foundation. He is a minister in the Fellowship of Mere Christianity.. He was formerly a pastor at Church of the Word in Painesville, Ohio (1984-1995) and Cornerstone Bible Church in Scotts Valley, California (2004-2014). Steve Schlissel has served as pastor of Messiah's Congregation in Brooklyn, New York, since 1979. Born and raised in New York City, Schlissel became a Christian by reading the Bible. He and Jeanne homeschooled their five children and also helped raise several foster children (mostly Vietnamese). In 2003, they adopted Anna (who was born in Hong Kong in 1988, but is now a U.S. citizen). They have eight foster grandchildren and fourteen "natural" grandchildren.